I’m sure you all know it’s that time of year again. 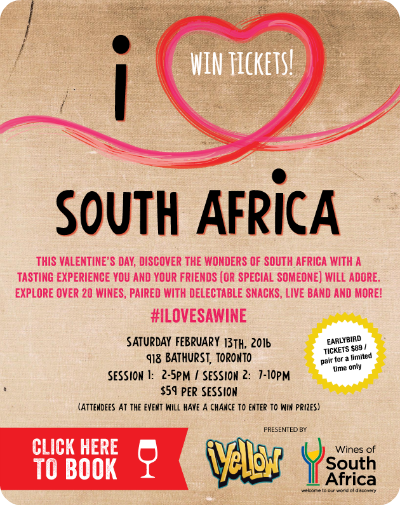 While I will be spending the afternoon of February 13th with my favourite lady friends for #GalantinesDay, I will be spending the evening at iYellowWine’s annual South African Wine celebration at 918 Bathurst. Thanks to the lovely ladies at iYellow, I have a pair of tix to give to one of you as well. If you don’t know what to do on this Hallmark holiday (beyond watching How To Be Single, obviously), there’s really nothing better than spending 3 hours tasting 24 wines (including 8 from Vintages) with your favourite person. To enter, email me at lisa@turntherecordover.com with the subject line “I Love Wine” and mention the session you prefer to attend (specify either 2pm or 7pm). Followers can also gain bonus entries by sharing this giveaway on Twitter (include the #iLoveSAWine hashtag) and hearting/commenting on my photo about it on Instagram. If you want to get your plans for the high pressure weekend solid asap, you can buy your tickets here today. There’s no better way to surprise your boo, promise. Contest closes and the winner will be contacted via email on Wednesday February 10th.